Ours is an eminent name of the industry, which is engaged in manufacturing, supplying, trading and wholesaling a comprehensive range of LED U Turn Arrow traffic Signals. Offered range of LED U turn arrow traffic signal is manufactured by our experts making use of excellent quality raw material and advanced technology in the field of traffic signaling. 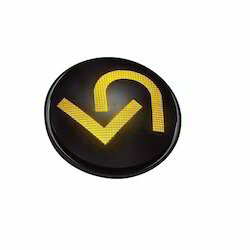 Further, these traffic LED U turn arrows are available with us in several colors and other specifications. Pertaining to the clients' requirements, we have been committed to manufacture and supply premium quality LED U-Turn Traffic Signal. Our offered signal is designed and developed by incorporating advanced technology and techniques in order to satisfy the needs of clients. This signal is made available in different sizes, grades and specifications as demanded by our esteemed clients. Post-production, this signal is thoroughly examined on various parameters like flawless finish and high performance. 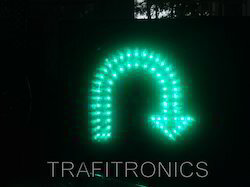 We are offering this LED U-Turn Traffic Signal at most affordable prices. With the aid of modern tools and sophisticated technologies, we have been able to provide customers LED U Turn Arrow . Available in 300 mm & 200 mm diameter, our offered turn traffic signals are manufactured using green LED using high-grade raw material and other basic components that are obtained from reliable vendors of the industry. Known for accuracy, our offered turn light signals are developed in accordance with the industry set guidelines. High brightness: LED light applied, brighter in color effect. Long life time: High up to 80000 hours. Looking for LED U Turn Arrow ?